The Karen State’s Kyainseikgyi Township has received Ks 10,128 million for the community driven development (CDD) project, which has been carried out in joint cooperation between the World Bank, the Ministry of Agriculture and Irrigation, and the Department of Rural Development within a period of four years, the project coordinator said to Karen News on September 12. “A total of Ks 10,128 million has been received for the four-year project. Ten groups have submitted work schedules to start the final year project in 355 villages under 50 village groups. Financial support for eight village groups has already arrived in Myanmar Economic Bank. The village residents don’t have to pay them back. 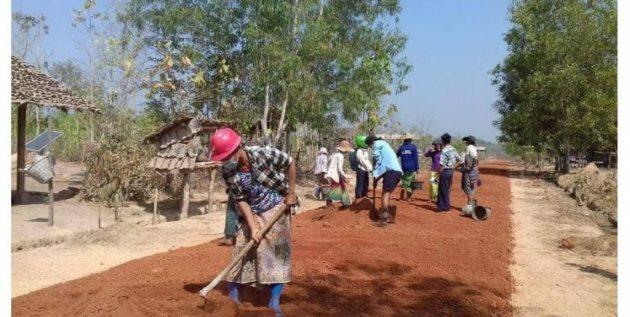 The financial aids have been given to fill in the needs for basic infrastructures such as water, electricity, and roads,” said U Tun Tun Oo, supervisor in-charge of the project. Financial aids have been given to respective village group based on the population and the local residents have to fill in the needs for schools, drinking water, electricity, roads, and other basic infrastructures on their own and businesses that would only benefit individuals and building of religious buildings have not been allowed, according to the official. “We’ve been able to build school buildings, school toilets, wells, and school fence using the financial aids from the project. It’s convenient for us since we don’t have to pay them back. It’s not easy to do this with our own budget. If we submit to the government and the parliament, there would be delays and we would have to wait due to lack of budget. The village has received over Ks 100 million for four years’ worth of financial aids,” Saw Hla Moe, administrator of Taung Dee Village Group, said to Karen News. Since the 2013-2014 fiscal year, the CDD project has been carried out in three least-developed townships across the country. Kyainseikgyi Township was selected within the Karen State in 2016. Financial aids will be provided to Kawkareik Township and Hlaingbwe Township for four years starting from 2018, according to the officials of the CDD project.